Round one win in 60 seconds Watch highlights from Collingwood's 2-point win over Coburg in round one of the VFL. Chris Mayne has been named in an extended VFL squad for Sunday's match. Photo: Shane Barrie. Collingwood has named an extended 31-man squad for Sunday’s VFL clash with Essendon. With ANZAC Day falling on a Tuesday, it means the two clubs are in the unique position of not naming their AFL squad until 5pm on Saturday. As a result, the VFL squad filed on Thursday evening is an extended and interim squad, which will be finalised once the AFL team is lodged. As it stands, 21 AFL-listed players have been named, with 13 players currently on an extended interchange bench. All final squads will be published on collingwoodfc.com.au and on the club’s social media channels when confirmed over the weekend. All supporters are encouraged to head to Windy Hill on Sunday to cheer on their VFL Magpies, who will be looking to atone for last year’s defeat against the same opposition on the ANZAC Day weekend. 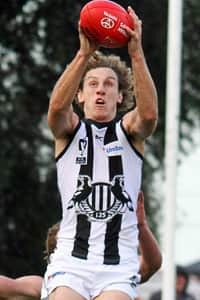 The Magpies began their season in fine fashion, holding off a fast-finishing Coburg to win by two points in the opening game of their campaign.